In some species the pelvic fins are unusually large, so the fish appears to have four wings. Most species reach a maximum length of 30 cm, though a few may be as long as 45 cm. Their eyes are relatively larger than those of other fish as well as flatter which improves visual acuity in the air. Flying fish live close to the water surface and feed on plankton. To prepare for a glide, the fish have the ability to swim rapidly close to the surface of the water, with their fins close to the body. As they leave the water, they spread their fins. The caudal fin is usually deeply forked, with the lower lobe longer than the upper. The fish rapidly move the lower lobe to propel themselves forward once the rest of the body has already left the water. Eventually, even the tail leaves the water and the fish are airborne. Flying fish can reach heights up to 1.2 meters. They can even flap their "wings". In gliding, flying fish can almost double their speed, reaching speeds up to 60 km/h. The glides are usually up to 30-50 meters in length, but some have been observed soaring for hundreds of meters using the updraft on the leading edges of waves. The fish can also make a series of glides, each time dipping the tail into the water to produce forward thrust. 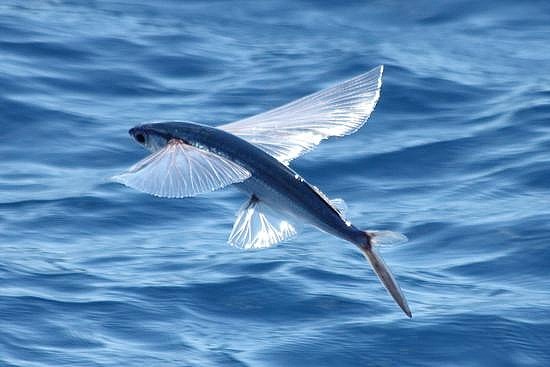 Flying fish use their unusual flying talent to escape predators such as swordfish, tunas, and other larger fish. In May 2008, a Japanese television crew (NHK) filmed a flying fish off the coast of Yakushima Island, Japan. The creature spent 45 seconds in flight. This is thought to be one of the longest recorded flights by a specimen of that family. The fish was able to stay aloft by occasionally beating the surface of the water with its caudal fin. The previous record was 42 seconds. Tobiko in varying colors, the bright orange roe is the natural coloration. Flying fish, often preserved by drying, are a staple of the Tao people of Orchid Island. In Japanese cuisine, flying fish roe (Tobiko), often from Cheilopogon agoo (Japanese flying fish), is used to make some types of sushi.